This is the predominant kind of poverty for it is the lack of money or cash. Having streams of income, investments and savings will help you conquer this type of poverty. This is the poverty of the mind. The mind is a power house and whatever influences the mind, influences the whole being. This type of poverty is triggered by poor information, bad environment and ignorance. This is the kind of poverty that affects the outlook of a person. It can be caused by ill health, poor dress sense or unhygienic lifestyle. A person with poor health is physically poor because health is wealth. Never make money at the expense of your health for you will spend the money treating ill health instead of enjoying the money. This is a kind of poverty where one is not contented with what he or she has. This kind of poverty leads to greed, jealousy, anger and bitterness and these are lids to ones success, wealth and prosperity in life. To have money and have no good reputation is poverty. A good name is better than silver nor gold. I see people who are desperate to make money, they step on toes and do mean things but at the end the feel empty because they spent time pursuing vanity instead of value. You often heard that ‘’the spiritual controls the physical.’’ Humankind are spiritual beings on earthly journey therefore understanding whose we are and who we are is very important in life. A belief in a higher power gives us hope for betterment ahead. As a Christian, I believe in God because He’s the one that gave us power to make wealth and people of other religions have their belief-anchor too. One without a spiritual backbone is poor and bankrupt. 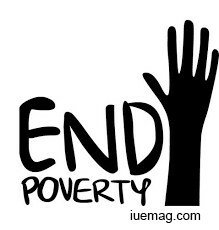 Poverty is very bad, it can mess ones life up and a poor man has no friend. To become a person of influence, you need to break away from the shackles of poverty for is limitation. Ifeanyi Enoch Onuoha is a contributing writer at Inspiration Unlimited eMagazine.